Vanilla Minecraft doesn’t have a roads system. There are railway blocks, sure, but no roads designed for cars. But if you’ve installed a car mod for Minecraft, then you may want to install roads in your world. 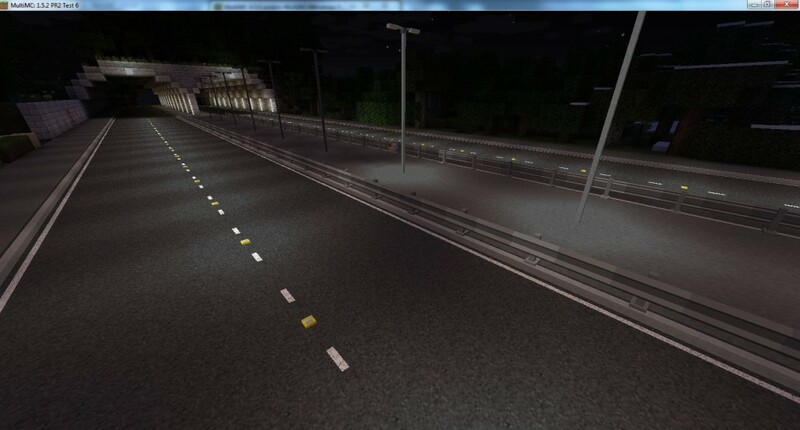 Roads enhance the realism of Minecraft and help players create living, breathing cities. If you installed Flan’s Mod, for example, then you probably have dozens of cool cars in your game but no realistic place to drive them. That’s why the FlenixRoads Mod is such a valuable mod. With the FlenixRoads Mod, players can enjoy driving or walking on ridiculously good-looking roads. The roads in this mod are more than just pavement blocks with lines scribbled on them. There are dozens of road blocks that cover everything from city crosswalks, passing lanes, parking stalls, and more. There are even curb blocks that you can add to the sides of your roads to prevent you from going off the edge. To fully enjoy this mod, the creator suggests installing a special texture pack called Silvania: Ultimatum Official Texture Pack. That texture pack features textures of 64×64 resolutions and it really makes the FlenixRoads Mod look fantastic. Basically, this mod adds a bunch of pavement and roadway blocks to your game. You can use these blocks to create all sorts of different driving situations in your Minecraft world. When this mod was first released, the roadways were fairly basic and simply featured black blocks with white lines in between. Today, you can take a look at the screenshots on this page to see how much things have changed. I should point out right now it’s 1.6.2, but 1.6.4 versions will be coming very soon. This mod is very nice!! !